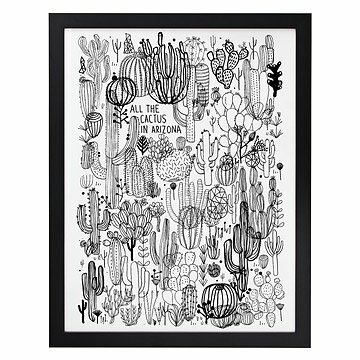 Whether you're partial to top-notch golf courses, luxurious resorts, and eye-opening museums of Phoenix or Tucson's scenic Saguaro National Park, you'll find a bit of all your favorite parts of the Grand Canyon State in James' adventurous print. James illustrates this desert locale's omnipresent multi-armed giants, prickly cacti, in order to personify this scenic southwestern state. A fun art piece to relive a vacation or to remember your past or current home, this hand-pulled one-color silkscreen print brings the spirit of this sun-baked state to your very own home. RFK Rives paper. Handmade in Brooklyn.